Sequel to the popular injunction obtained by his excellency Rochas Okorocha from the federal high court seating in owerri on the 18th May , 2018 by Barr. Mbagwu Augustine and four others against the APC and 10 others. Chief Uche Nwosu congratulates Barr. Mbagwu. 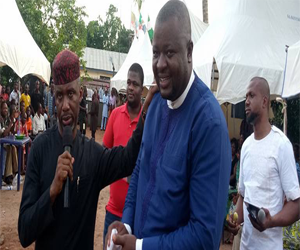 Amidst cheers by APC faithfuls of Owere- Nkworji in Nkwere L.G.A, on the occassion of the All Progressive Congress (APC) campaign held at the party secretariate in Nkwere L.G.A, sunday 20th May 2018, the political atmosphere has taken a new dimension as a particular position of interest which would have been held by Chief Chibuike Ahamefula DG Ugwumba Movement, might now be transffered to Barr. Mbagwu Augustine. Prior to this time, Barr. Mbagwu was a ward Chairman and a frontliner in APC politics in Owerre-Nkworji as well as Nkwere L.G.A. Chief Ahamefula who is the DG Ugwumba Movement and leader in the same ward with Barr. Mbagwu, was already nursing the idea of becoming the L.G.A Chairman of Nkwere before the Apex leader Chief Uche Nwosu on saturday raised the hand of Barr. Mbagwu affirming his new status as the darling of the party in Nkwere L.G.A.